Some times ago, I received (and very gladly published) a piece of the poet and writer Davide Rondoni, who kindly accepted my request and spoke about the “Carnival of Physics” # 27, hosted some times ago by my italian blog GruppoLocale.it. I stumbled upon this article just yesterday, and I realized that it may be worth reading also for not italian people.. so here is it! Arthur Rimbaud says that science is too slow for us. In our opinion, he means that we look at the world with the typical method of poetry, which is that of analogies, shadows, glimpses of evidence in the appearance. With words that frame a life that we don’t really know but which nevertheless asks for our active participation. Besides, long before you physicists taught us that everything is movement and energy, Dante spoke of a “love that moves the sun and the other stars” and to him that was not a metaphor, but a real matter of fact. We are dealing with a difference of speed – the truths to which the poetic method leads are those a man needs in his life, whereas science takes sometimes thousands of years in order to succeed in analyzing some phenomena. Difference in speed and method therefore, (poetry knows by synthesis, by analogy, experiencing that state of knowledge through wonder and spiritual enlightenment that in science happens only sometimes), but not in the route nor in the final purpose. In fact, the language that scientists often use to indicate the primary or last realities they are looking for – in addition to the formulas – is composed of poetic metaphors. What is the “fossil light” that the recorders of the early events of the universe are analyzing? Isn’t it a reality which we can explain using a poetic language? And a great contemporary poet, Les Murray, in one of his poems says that Newton certainly had a huge intuition seeing the apple falling from the branch, but if he had also wondered how the hell that apple had arrived up there he would have discovered a “more used physics.” Poets are interested in the physics of the world, that is to say its movement – or sense, which is the same, since there is no real movement without sense, because it would be frenzy or excitement, or (which is the opposite and the same), it’d be boredom. Poetry and science are not opposed: they were not opposed at the beginnings of wonder, which perceives the world as a first step, and they are not opposed now – after the long journey of both – when they are carried out as a will of knowing the mystery of reality. That is what Ungaretti called the “secret” of the world. 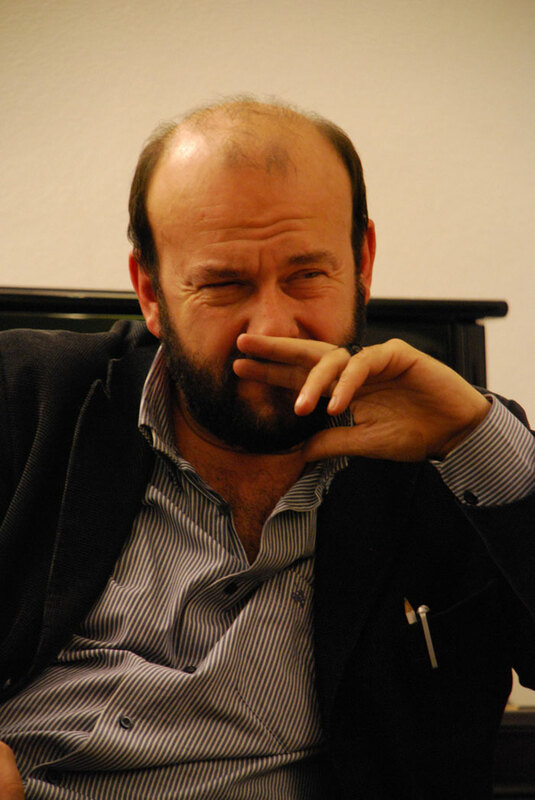 Davide Rondoni has founded and heads the Center of Contemporary Poetry of the University of Bologna. He has taught and teaches poetry and literature at the University of Bologna, Milan Cattolica, Genoa, Iulm and at several institutes as well as abroad at Yale University and Columbia University (USA). He is the artistic director of “DANTE09”’s festival in Ravenna. He took part in the most important poetry festivals in Italy and abroad. He has published several volumes of poetry, including “Il bar del tempo” and “Avrebbe amato chiunque” with whom he has won, among others, the most important prizes in Italy (including Montale, Carducci, Gatto, Ovid, Camaiore, Metauro). “Amore Apocalisse”. Mondadori, June 2008. A booklet published in 2001, “Non sei morto, amore” (and republished in 2006) is read by the author together with a pianist of blues, as well as put on stage by Sandro Lombardi and David Riondino. With a company of tango are read the poems of “Danza lentamente con le tue ombre” (Tracce, 2009). He is also in the most important anthologies of Italian poetry of the late twentieth century published by Mondadori and Rizzoli and in many others. Some of his poems have been published in books or magazines in France, USA, Venezuela, Russia, England, Croatia, China and other countries. He is one of my preferred Italian poets, so that I’m very glad he accepted to write this words for my blog. The publication of this piece in English is also intended as a tribute to his arts. Thanks Davide!